A rapid change of plans (and Southwest Airlines) brought me to San Francisco one month earlier for an internship. When I say rapid, I mean that I went from “applying to flying” in two weeks. Even though I was staying with relatives in a safe area, accepting that I would spend the summer in California was a bigger step for my immediate family than it was for me. I’d planned for years to relocate to the west coast after college, but most everyone in my family never desired to live more than an hour from home. I did something that no one in my immediate family ever had, and only some of them supported my decision. The main reason I didn’t receive full support is because my family is very protective. Since childhood, I’ve been told things like: “Don’t do that! It’s dangerous.” “Don’t go there! You’ll (insert worst case scenario)!” “You can’t get a job there. It’s too far away. What if (insert another awful scenario) happens?” Though I do believe it came from a place of love, the key adults in my life unknowingly projected their fears onto me and their fears became mine. For years, I shied away from new opportunities out of fear, and not just the fear of an impending catastrophe. I developed fears of my own like rejection, failure, and disappointing those I loved. I agreed to everything my family wanted because I was afraid of upsetting them. I talked myself out of great ideas because I feared failing. I avoided going to unfamiliar places out of fear that something would happen to me while I was there. As a young adult, I should have seen the world as a place full of opportunities to seize. Instead, I saw it as a place waiting to seize me. Letting others tell my soul what to fear was what I’d done all my life. I had allowed others – specifically, my family – to decide what I should be afraid of, thus perpetuating a cycle of fear. Mentally connecting the dots, I found negative impacts of that cycle present in my grandparents, in my mother, and in myself. Three generations. I knew I couldn’t live that way anymore. The cycle of fear had to end with me. Around that same time, I began redesigning my business cards. I was tired of the airplane graphic I’d drawn in Photoshop a few years earlier. I wanted something more professional, more representative of my personality. I opted for a two-sided design with my contact information on the front and a rather meaningful quote on the back. Those cards go everywhere with me. Ideally, they’re with me in case I meet a new professional contact on my daily outings. More often, though, they’re with me as a reminder to continue fighting fear. It’s a fight that I must choose daily to win. I always hoped that one day, I’d be able to tell Foreman how much that single line of lyrics impacted my life. The aftershow drew to a close with the last chords of “Your Love is Enough” and we applauded. I realized this could be the one day I had hoped for. With his acoustic guitar still strapped around him, Foreman began walking toward his band’s bus, parked a few blocks away. I joined the end of a short line of people walking alongside him to say a few last-minute words. Immediately, that little voice called “fear” tried to talk me out of yet another idea: “Don’t worry about it. He’ll probably leave before you can say anything.” “He’s met hundreds of fans. What makes you any different?” I kept walking and drowned out that little voice with the quote. Never let another tell your soul what to fear. Sometimes “another” is yourself. Switchfoot performs at the Masonic. I believe in preserving artists’ autonomy and not making them accept something from me simply because I’m a fan, so I had planned to take the card back. To my surprise, Foreman smiled and asked, “Can I hold on to that? Is that for me?” I replied sure, if he wanted to keep it, it was his. He asked my name, I told him, and we had a slightly awkward handshake around his guitar. He said it was great to meet me and to have a good night, and I thanked him for playing the aftershow. Walking to the car, I was again overcome with emotions. 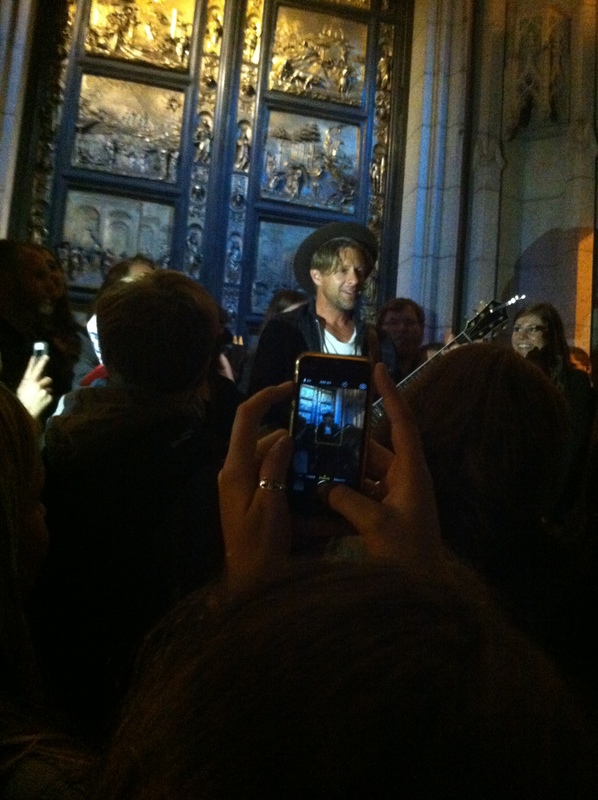 I was thankful for the opportunity and for Jon Foreman’s kindness to chat with fans. I felt a new sense of confidence from stepping out of my comfort zone. I was proud of myself for fighting not only my introverted nature, but another fear – the fear of speaking up. I realized the importance of not listening to the fears that say I have the duty to remain silent. Fighting fear has been easy some days and challenging on others. There are days when I feel I’ve overcome it completely, and other days that I still give in. I’ve learned to put more trust in God, which has helped me to be kind to myself on the tougher days, remembering that most battles aren’t won overnight. It’s changed how I respond to my family, loving and honoring them as always, but taking care not to let their fears become mine anymore. Almost two years into the process, I still have areas that need improvement, but I also have areas of great progress. A big step in my fight is sharing this piece. It was in my Drafts folder longer than I care to admit, though I will admit that fear was partly why it took me so long to publish it. Today, I reminded myself of the quote that inspired this piece and the importance of not allowing another to tell my soul what to fear, even when “another” is myself. Thanks so much, Amelia! Moving across the country even temporarily is tough, even more so without full support, but I definitely grew from the experience and I’m so glad I took the chance. Hopefully, I’ll make a permanent move soon. (The job search is so, so brutal). Also, I hope you’ll get to see Switchfoot live someday! Thank you for reading! I truly appreciate it and I’m glad you enjoyed it.